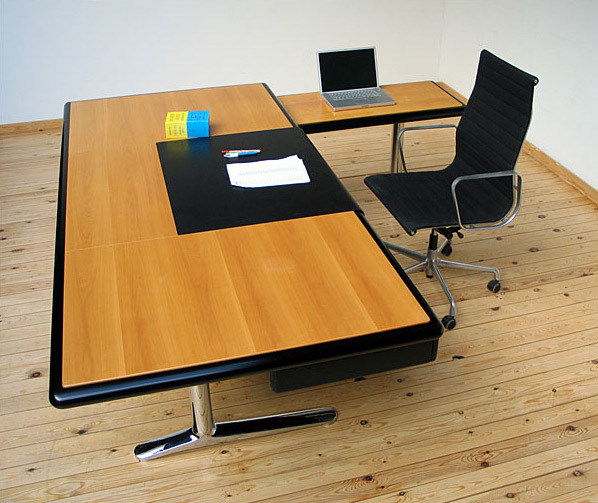 Oak and leather office desk with drawer in black leather, feet in chrome plated cast iron. Extension (Dimension: height: 25,98 inch, width: 40,94 inch, depth: 20,47 inch) on the side that easy can be removed. Desk from the Executive Office Collection designed by Warren Platner for Knoll International. Bureau en chêne et cuir avec tiroir en cuir noir, pied en chrome. Extension (Dimension: hauteur: 66 cm, largeur: 104 cm, profondeur: 52 cm) de bureau sur le cote que peut être facilement enlève. Dessinée par Warren Platner (Executive Office Collection) pour Knoll International.